You have two options. First, fill out the Instant Quote Now! and you can get an instant price. It does not have to be exact to get a real time quote. 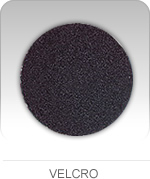 We need some basic information - and general size of the patch and we will provide you with an instant price quote. Option 2 is to call us at (877-516-4360) and we quote you over the phone. This steps also allows you to consult with our patch professionals and ask as many questions you need so that you fully understand the ordering process. We’re behind you every step of the way! 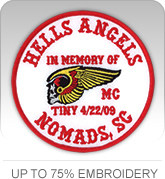 After we receive your information, and have answered questions you have, we will price your custom designed patch for you! No clipart or preset designs here. Our expert designers develop a masterpiece just for you. Once your initial ‘Proof’ is completed, we email it to you along with a price quote meeting your exact specifications. Once you’ve received your design and quote, you are free to request as many revisions to your design as needed to make it just right. 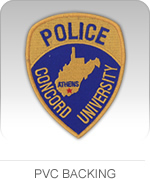 Your satisfaction is our highest priority, and we take great pride in designing the perfect patch just for you! 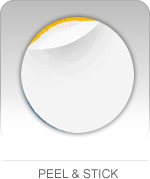 Once your design and quote have been reviewed and finalized, you can approve your order for production. Once production begins, most orders arrive in 7-14 days unless otherwise noted. 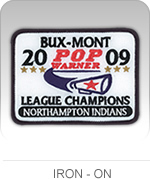 Our turnaround time is the fastest in the industry, and it’s helped us earn our reputation as a leading manufacturer of custom embroidered patches. You can call or write us any time to check the status of your order, and our friendly representatives will be eager to assist you! If you have any questions about our ordering process or our products, please call us at (877) 516-4360 or email us at [email protected].com today. 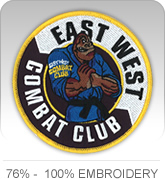 The embroidery percentage determines how much stitching vs mesh there will be on your patches. Lower embroidery percentages mean less stitching and more mesh. 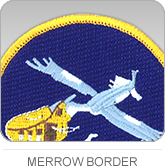 A merrow border is a thick stitched edge, most commonly found on circular, square or oval shaped patches. 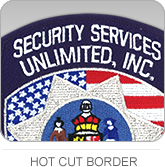 A Hot cut edge is a very thin stiched edge which is most commonly found on uniquely shaped patches.